FC FILM2 03 is a transfer paper Shock Line for various light colored surfaces. It is a cut and weed transfer which transfers a thin but strong film which protects the print. Provides excellent wear resistance. 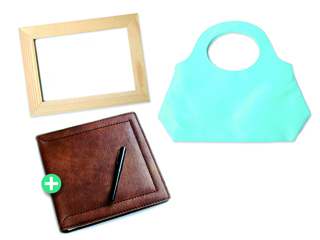 Excellent for natural or artificial leather, cardboard, cork and canvas. Suitable for clothes and leather or leatherette accessories, wood furniture and cardboard boxes or folders. For further information, instructions andwarnings, download the form.